This book is methodologically unique in scholarly literature on Muslim society. 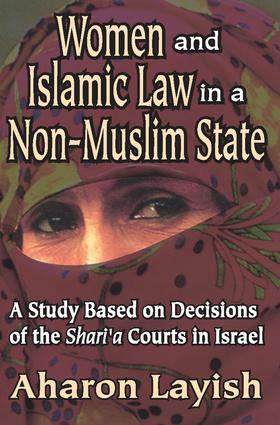 Its originality lies in the fact that the rich material offered by the shari'a courts is given a thorough analysis with a view to drawing conclusions about the present-day phenomena in Arab society and processes that the society has been undergoing in modern times.Aharon Layish examines every aspect of the social status of Muslim women that finds expression in the shari'a courts: the age of marriage, stipulations inserted in the marriage contract, dower, polygamy, maintenance and obedience, divorce, custody of the children, guardianship, and succession. Each chapter opens with a short legal introduction based on all the sources of law applying in shari'a courts, followed by social analyses and a study of the attitudes and approaches of the qadis, or Muslim religious judges. Layish examines the relationship between shari'a and Israeli legislation: Do shari'a courts have regard to the provisions of Israeli law? What is the relationship between shari'a and social custom, and which is decisive in regard to Israeli Muslim women? To what extent does Israeli law actually affect Israeli Muslim women? What is the attitude of the qadis, toward Israeli legislation?Women and Islamic Law in a Non-Muslim State is an important and original study that will be of interest to students and scholars of Islamic law, comparative law, sociology, and modernization.